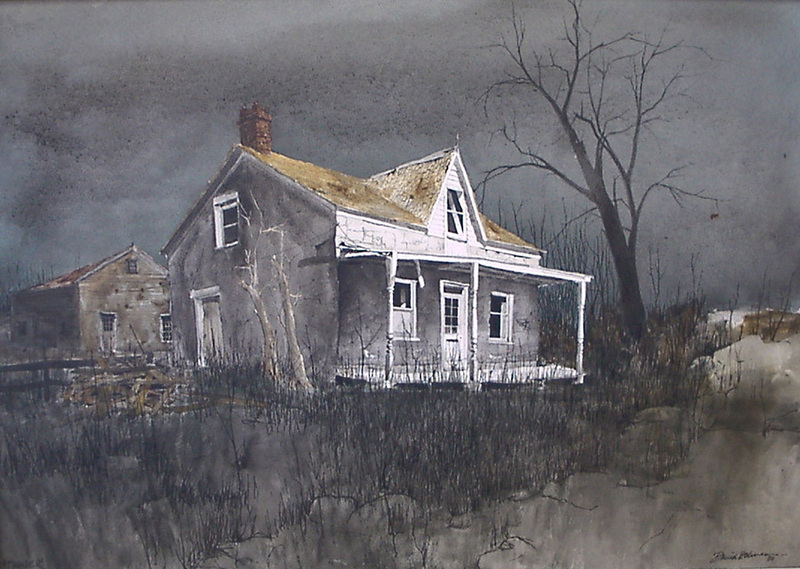 The English born Canadian painter, David Bryan Holmes, wrote those words before he began painting abandoned, deserted homes and farmsteads in the United States with the same affection and respect he had lavished on Canadian scenes, but the sentiments he expressed in them are equally applicable to the paintings he made of American rural scenes, particularly in the New England states. Holmes also enjoyed painting trees, plants, landscapes and boats, but his canvases are principally devoted to deserted farms and homesteads devoid of the human figure, yet impregnated with a sense of life fully lived there at one time, often indicated by a farm implement left outdoors to decay, a door ajar from which one expects someone to step out, a curtain still left hanging in a window. David Holmes was born in 1936 outside London, into a down to earth, business minded family in which a son with artistic gifts and longings seemed almost a changeling. Parental approval of the boy’s longing to draw and paint did not go much beyond that novel method of getting paint brushes. When young Holmes offered to use his weekly allowance to pay for private art lessons, the idea was not welcomed. However, when he was about twelve years old, he was allowed to go alone into London to visit the National Gallery, the Tate Gallery and numerous other museums, as well as the commercial art galleries. Young as he was, the boy found the British Museum – more exciting than the celebrations of Christmas. The old Roman examples of art exhibited there and the Roman excavations at St. Albans excited him so much that he made sketches of the Roman villas, aching to record everything in his drawings. He was obsessed with the problems of perspective and studied the paintings and drawings of Canaletto in an effort to learn how to draw little streets in and about London, the local churches and cathedrals. Canaletto served him well as a master, for a drawing Holmes did of St. Mary’s Parish Church in London was used for a Christmas card which sold so well that the proceeds helped increase his art supplies. In the hours and days he passed in London’s great museums and galleries, Holmes learned to love the work of Rembrandt, Durer, da Vinci, Raphael, and among the more modern artists, that of Turner, Winslow Homer, John Singer Sargent, Thomas Eakins, Andrew Wyeth and Jean Jansem. In the pen and silverpoint drawings of Albrecht Durer and Leonarndo da Vinci he found encouragement for what he wanted to do. Silverpoint drawing was such a challenge to him that he prepared his own paper for it, bought a piece of sterling silver wire, and then drew weeds, trees, anything he could find growing outdoors. In the art teacher in the boarding school Holmes attended in 1949 and 1950, he found the first adult who seemed to understand why he wanted to pursue a painters’ career. In 1953 he began to attend the Harrow School of Art and there he began to paint still lifes in oil. But he was dissatisfied, feeling that he needed to learn drawing and the secrets of perspective, and convinced that at seventeen he needed solid, basic instruction in realistic drawing much more than initiation into the techniques of painting in oil. On the other hand his family was urging him to acquire what they considered a more solid education, so he elected the field of printing, design and typography. During the six years of training in that field, he attended art school at night at Twickenham Technical College, working in gouache, tempera, egg tempera, oils, charcoal, India ink, pencil and silverpoint. At the conclusion of the course, Holmes received the “City and Guilds Diploma” in printing, graphic design and typography. In 1957 David Holmes was called for military duty and served in the Royal Marines for two years. He spent one year on Christman Island in the Pacific Ocean, where he sketched and drew the life of the native Gilbertese on the island. One year after his return to civilian life in England, he decided to visit friends in St. John, New Brunswick. He stayed there four years, having reached a decision to remain on the North American Continent. He worked as a typographer and designer and traveled as much as possible, using his travel as occasions to paint. While he was living in St. John, he attended evening art classes at the St. John Vocational Institute, giving exhibitions of his work at the New Brunswick Museum. During this period, Holmes was painting in oil, but more and more he turned towards tempera and pen and wash, employing the modern colloidal tempera. Tempera, he discovered was a medium in which he could portray his subjects in great detail. Canada presented Holmes not only with a new way of life, but, in a sense, with a break from his past. When he left London for New Brunswick, he left behind all the art work he had done up to that time. And during his first two years in Canada he mailed many of his paintings and drawings back to England. In 1969, when his parents retired to North Wales, he arranged to have a trunk containing all this collection of his work shipped to him. It vanished en route and was never found, so nothing was left to Holmes of years of work. In 1964 Holmes decided to move from the Canadian coast inland to Kingston, Ontario, where he found a position in a printing firm through a newspaper ad. But his work as an artist became known so swiftly in Kingston that very shortly he left the printing firm and became a successful free lance artist. He entered competitive exhibitions in Kingston, Toronto and Montreal, as a result of which he received awards in 1967, in 1969 and 1971 in the juried exhibitions at Queen’s University, Kingston. He was invited to present a two-man exhibition in 1967; was awarded membership in the Society of Canadian Artists, with whom he had been exhibiting in 1970. The Willistead Art Gallery of Windsor purchased one of his paintings for its permanent collection in 1968; in 1969 he won an award in the City of Montreal’s annual art exhibition. In spite of his successful exhibitions and winning of awards, Holmes continued to study art. In 1965 he entered the summer art school at Queen’s University, Kingston, and in 1971 he spent three months at the Art Students League of New York drawing under the influence of Robert B. Hale, one of North America’s outstanding teachers. With his studies he combined teaching, both privately and at Queen’s University. In 1972 David Holmes signed an exclusive contract with Wally Findlay Galleries. David Holmes died at the age of 58 in 1994 in Canada.